Each year the department confers awards for both academic achievement and service to the department. This year (2017) saw the introduction of the Jonathan Gross Prize, which honors students who graduate at the top of their class with a track record of promising innovative contributions to computer science. Five graduating computer science students—one senior from each of the four undergraduate schools and one student from the master’s program—will receive the prize each year. 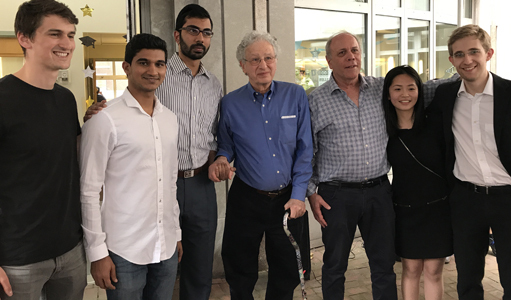 Named for Jonathan L. Gross, the popular professor emeritus who taught for 47 years at Columbia and cofounded the Computer Science Department, the prize is made possible by an endowment established by Yechiam (Y.Y.) Yemini, who for 31 years until his retirement in 2011, was a professor of computer science at Columbia. 2017: Filipe de Avila Belbute Peres (Columbia College), Mitchell Gouzenko (SEAS), Rudra Gopinath (General Studies), Lanting He (Barnard College), Gaurav Gite (MS, SEAS). Profiles of each can be found here. This annual award, established by the Computer Science Department in 1992 in memory of Russell C. Mills, a Ph.D. candidate in Computer Science who exemplified academic excellence and intellectual curiosity, is a cash prize given to a computer science major who has exhibited excellence in the area of computer science. A cash prize presented to a computer science senior who has excelled in independent projects. This is awarded in honor of Professor Theodore R. Bashkow, whose contributions as a researcher, teacher and consultant have significantly advanced the state of the art of computer science. Superceded by the Kosoresow award. Established November 2000. This award is given to a PhD student in Computer Science who has performed exemplary service to the department, devoting time and effort beyond the call to further the department’s goals. It is given in memory of Dr. Paul Michelman, ’93, who devoted himself to improving our department through service while excelling as a researcher. The faculty selects those doctoral students agreed to be in the top 10% in service contributions, and awards them a certificate. The names and contributions of these students are announced electronically to the department by the department chair, and are also published in the CS Newsletter. The awardees are also invited to a celebratory meal with a subset of the faculty.